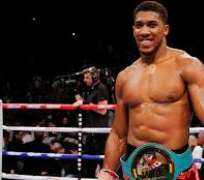 Anthony Joshua is optimistic about beating New Zealand's Joseph Parker whey they go out in the Ring at the Principality Stadium, Cardiff, Wales on the 31st of March 2018. Joshua who currently holds the WBA and IBF belts says he does not see any human stopping him, “I took my time last time out (against Carlos Takam) because I wanted to set up a good 2018. It’s about making history now, it’s an honour to be up here with another world champion. “I take everything with a pinch of salt, I don’t know what to make of Parker. I’m looking forward to the challenge, not only from a physical standpoint but also from a mental one.